Scientific research and statistics go hand in hand. Whether they’re determining the effects of sleep on long-distance truck drivers or assessing the accuracy of polygraph tests, statisticians play a vital role in analyzing research data. And for more than four decades, faculty members from Carnegie Mellon University’s Department of Statistics have used data to help shape policy decisions that impact our lives through their work with the National Academy of Sciences (NAS). The NAS began during the Civil War, when President Abraham Lincoln enlisted the nation’s most distinguished scientists to develop compasses for ironclad ships. Today, the academy continues to gather the best and brightest of American researchers to form multidisciplinary panels that make legislative recommendations. But regardless of a panel’s focus, statisticians are part of the team. “The heart of science these days is in statistics,” said William Eddy, the John C. Warner Professor of Statistics, Emeritus. Eddy is one of several Statistics Department faculty and alumni who’ve participated on NAS panels and committees. In fact, Eddy has been designated a lifetime National Associate by the NAS. He also holds the distinction of being the only person who has chaired both the Committee on National Statistics (CNSTAT) and the Committee on Applied and Theoretical Statistics (CATS). “We’re all problem solvers at CMU,” he said. Stephen Fienberg also appreciates connecting with other accomplished researchers through the NAS. “I’ve met friends and new collaborators and see different dimensions of what’s happening with science in Washington,” said Fienberg, University Professor of Statistics, Machine Learning and Cylab, Emeritus. Fienberg, one of four Dietrich College of Humanities and Social Sciences’ elected member of the NAS, has been deeply involved with the academy for over 40 years. He has served on 35 committees and panels addressing everything from bilingual education and census taking to research methodology and the accuracy of polygraph tests. And for the past 12 years, he has been part of the report review process, in which a team of up to 25 reviewers ensures that the results of a study are effectively and accurately communicated. Fienberg is responsible for reviewing 200 reports each year. He is currently serving on the Standing Committee of the American Opportunity Study (AOS). Other committee members include Jared Murray, a visiting professor of statistics, and Mauricio Sadinle (DC’11,’15), who received his master’s degree and Ph.D. at CMU under Fienberg’s guidance. The AOS aims to combine existing data from the U.S. census, surveys and programs like Social Security to study individuals and families over time. By linking existing records from a variety of sources, researchers can capture important demographic information without the prohibitive cost of traditional longitudinal studies. Miron Straf (S’64,’65) worked closely with Fienberg as research director of CNSTAT at the NAS. In 1985, the pair published a groundbreaking report on sharing research data. “We did that before it was popular,” said Fienberg. Straf, who spent most of his career at the NAS, believes CMU’s pioneering spirit is part of what sets it apart from other institutions. Daniel Cork (DC’96, HNZ’00) received a joint Ph.D. from CMU in statistics and public policy and is a senior program officer for CNSTAT. He echoes Straf’s sentiments. “CMU’s great strength is interdisciplinary work at the extreme, dispensing with disciplinary walls whenever possible,” said Cork. Greenhouse is currently chairing a panel legislated by Congress to evaluate the scientific merits of a Department of Transportation system for assessing the risk of accidents among long-distance truck and bus carriers. Previously, he helped analyze the relative effectiveness of interventions for family violence. He says that the Statistics Department’s emphasis on the real-world application of statistics is key to the longevity and depth of its relationship with the NAS. 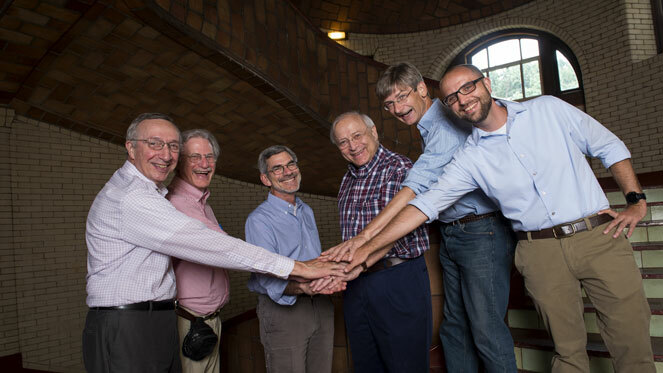 For more than 40 years, CMU statisticians have contributed countless volunteer hours of work to the mission of the NAS, building a reputation of excellence. The long and impressive list of participants includes Larry Wasserman, a professor of statistics and machine learning, who was elected to the NAS this year. In addition, Robert Kass, the Maurice Falk Professor of Statistics & Computational Neuroscience, has been a member of CATS since 2012. Brian Junker, professor of statistics and the associate dean for academic affairs in the Dietrich College, has served on four educational-related committees since 1999. And Joseph Kadane, the Leonard J. Savage University Professor of Statistics, Emeritus, has served on various NAS committees and panels since 1974.